The European Aerosol Federation (FEA) is the Brussels-based organisation representing members active in 18 European countries, including more than 350 small & medium-sized enterprises and multinationals active in the aerosol industry. 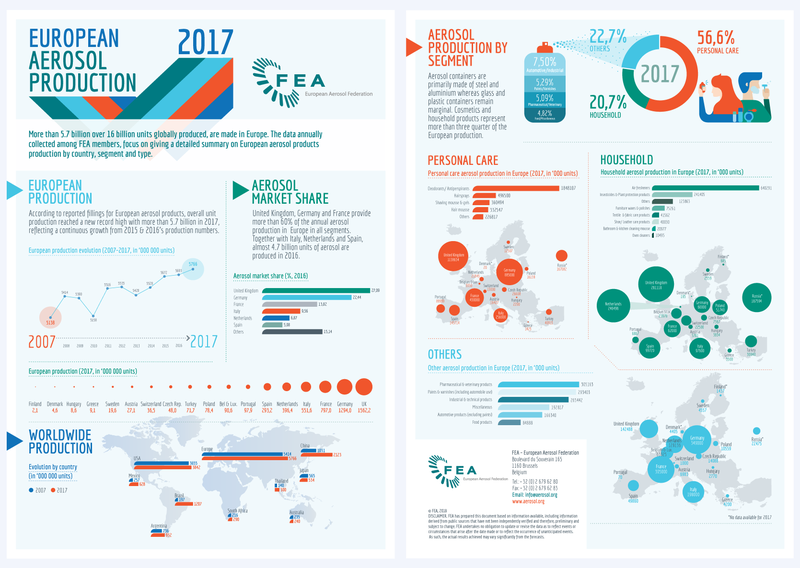 Every year, FEA publishes an update of the European aerosol production by country and by product category. Data on the worldwide market is also included. For the second year in the row, we worked together with FEA to present raw data in a more visually appealing way. The objective was to transform the classic Excel data in a way that numbers tell the story for the audience. Data accuracy remained at the core of the process during the visualisation process. The data was visualised and presented as PowerPoint slides and in print-friendly A4 format, providing access choice for the users.